The Better Retailing Awards are run in conjunction with the Health Food Institute to reward excellence in health food retailing. Each year Better Retailing magazine sends secret shoppers to visit independent health food stores all around the UK and Ireland and mark them in five sections - first impressions, store layout, personal attention, check out and overall impression. 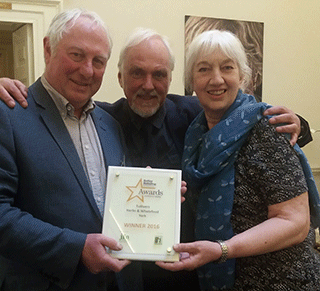 Tullivers of York is the winner of the 2016 Better Retailing Secret Shopper Awards, sponsored by the Health Food Institute. Tullivers owners Helen Spath and David Weston are pictured with Editor Alistair Forrest (centre) after collecting their award at the HFI annual lecture and luncheon. The store scored a record 46/50 points after our Secret Shopper visited at the end of last year.